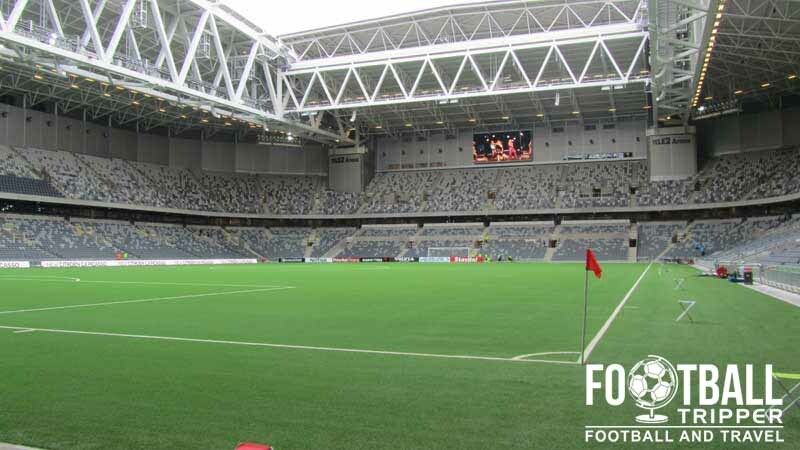 Stockholmsarenan known as the Tele2 Arena for sponsorship reasons, is a multi-purpose stadium located in the district of Johanneshov within the capital city of Stockholm. Primarily occupied by Hammarby, with Djurgårdens renting, the 30,000 all seater arena first opened in 2013. Tele2 Arena is a multi-purpose stadium which was constructed between 2010 and 2013 in order to satisfy the City of Stockholm’s need for a world-class sports and music venue. Designed by architects White, and built by engineering firm Arup, the stadium cost an estimated 2.7 billion SEK which equates to around €290 million euros. Initially financed by public funds, the high cost of the stadium has been somewhat recouped by the sale of the stadium’s naming rights, the income generated from events, and from the sale of land where the previous Söderstadion was located. 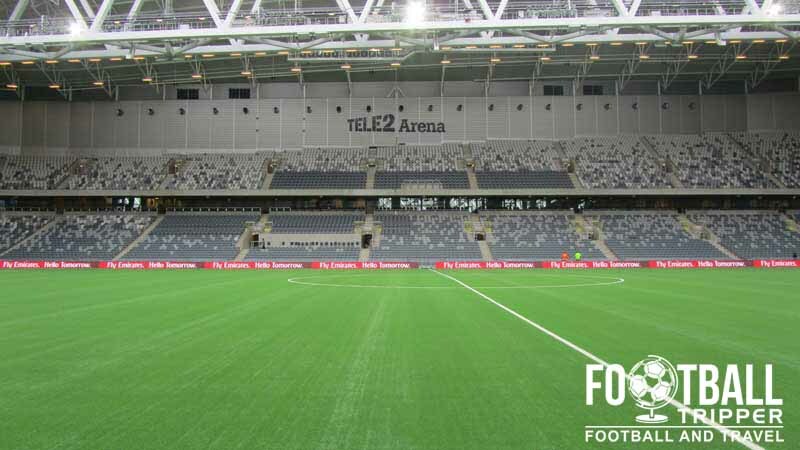 Designed with a fully retractable roof ala Amsterdam Arena and Millennium Stadium, Tele2 can be configured to host a multitude of events. Capable of accommodating up to 45,000 people during indoor concerts, the capacity for football is reduced to 33,000 for domestic matches where standing is permitted or 30,000 for UEFA sanctioned games which are all-seated. To give you an idea of how adaptable Tele2 Arena is, the pitch can be converted to an ice rink, American Football and even Speedway racing. Although one might assume that the two football clubs would inaugurate the stadium together by playing a friendly against each other this wasn’t actually the case. Hammarby IF and Örgryte IS played on the 20th July 2013 in front of 29,175 supporters, and the following day Djurgårdens IF took on IFK Norrköping in front of a slightly smaller crowd of 27,798. The stadium’s operators are Anschutz Entertainment Group (AEG) who also own stakes in Los Angeles Galaxy and Houston Dynamo. 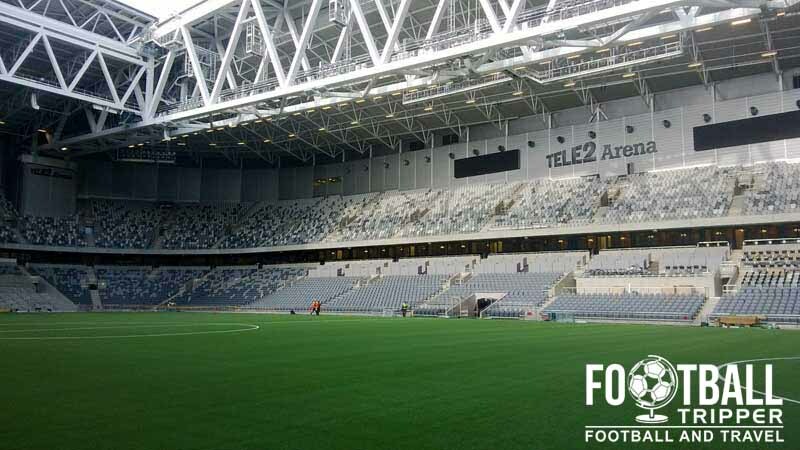 The Tele2 Arena is comprised of four stands: North, East, South and West. 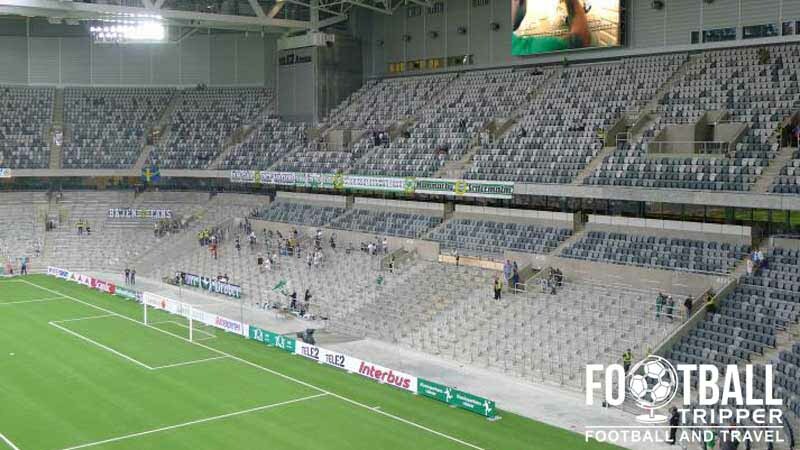 For the home matches of Hammarby, away fans (Bortasupportrar) are housed within the lower-tier of the south stand. Whereas for the home matches of Djurgarden away fans are housed within the lower-tier of the north stand. 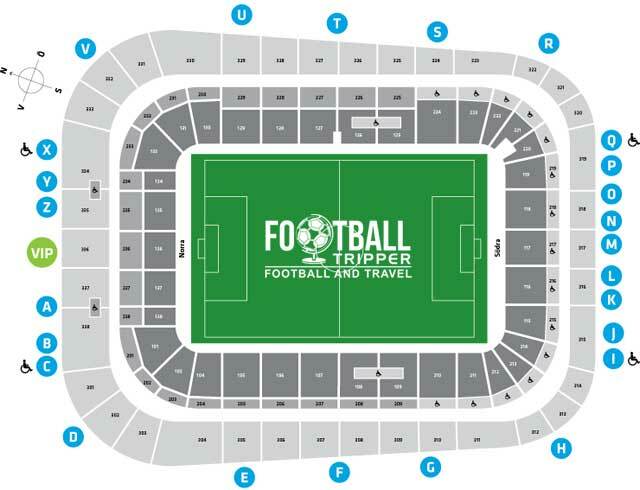 Within the stadium there are two bars located in 109 and 125 (Section A), and several pubs within 117, 118, 136, 217 (Section A) and 316, 318, 335, 337 (Section B). On matchdays official merchandise of Djurgarden can be purchased from the stall outside the stadium located between Tele2 Arena and The Globe Entrance 6. You can also purchase souvenirs and mementos online from each club’s respective online stores: Djurgarden & Hammarby. It doesn’t appear as if tours are currently available of Tele2 Arena which is certainly surprising. Should this ever change in the future we’ll be sure to update this section. Tickts to see both Djurgarden and Hammarby play at Tele2 Arena can be purchased through pretty much the same channels: online from each club’s respective websites (print at home or smart phone scan), via telephone (077-131 00 00), and from the ticket office either during the week or from two hours before kick-off on matchdays. Prices for both teams start at 100 kr for something behind the goal, and go up to around 300 kr for something central within the main stands. Tele2 Arena is situated adjacent to the iconic Ericsson Globe exactly 5.0 km south of Stockholm’s city centre within the district of Johanneshov. From Södermalm/Skanstullsbr in the city centre you’d be looking at a walk of around 20 minutes. The parking garage at the stadium has enough room for 650 cars per match, and the one across the road at the Globen Shopping Centre has a further 1,500 spaces. The district of Enskede where Tele2 Arena is located is essentially served by Årstaberg station which has direct connections to Stockholm Centralstation. The arena is served by its own metro station which is known as Globen and is served by T-Bana lines number 19 and 29. Alternatively you could also catch the number 17 and 18 to Skarpnäck or Gullmarsplan. The Gullmarsplan bus terminal which is adjoined to the T-Bana Metro Station is only five minutes from the stadium. The closest International airport is Stockholm Arlanda Airport which is located approximately 35 km north of the city centre or 20 minutes via the Arlanda Express high-speed train service. There is also Stockholm Bromma Airport however it mainly serves domestic routes. Within the entertainment complex where the stadium and the Globe sit there is a Quality Hotel and a Bo Hotel. With a large city literally on your door step neither are really the greatest options with anything north along the metro line back towards Central Station much preferable.